Prime Minister Gillard's 'education revolution' is limping toward an unhappy end. The revolution has been long on hype and activity, short on focus. Big promises and money have been spent on technology and physical infrastructure, programs targeting literacy, numeracy and teacher education, the launch of MySchool and its detailed profiles of every school in the country, the resuscitation of a national curriculum, the announcement of the first-ever national target for schools ('top five by '25'), and of course, on Gonski. On 19 April Gillard goes to COAG (Council of Australian Governments) in search of a deal, any deal on the most important and iconic element of the revolution. She knows that even the most transparent appearance of a deal on Gonski may make the difference between certain political death and the slim hope of political resurrection. The problem is that she has a desperately weak hand as well as desperate circumstances. 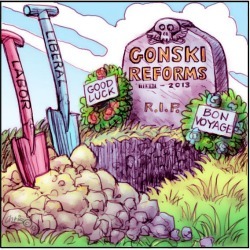 In an effort to keep the appearance of Gonski she has already bargained away most of its substance. Remember what the substance was: Many Australian students leave school without a decent educational grounding or sufficient understanding of words and numbers to cope with the demands of the workplace or ordinary daily life. All public funds, state and federal, should therefore be allocated to schools according to 'need' — i.e. in proportion to the size and difficulty of the educational tasks they face — irrespective of the sector to which they belong. Any school, independent, Catholic systemic or government, with high proportions of children from poor, Indigenous, or rural/remote families, should get more money on a common scale from a common pool. The backsliding began before Gonski even got started: his riding instructions from the government were to ensure that 'no school will be worse off'. As Gonski pointed out, that meant in practice that yet more money would go to some of the least needy of schools, making it difficult to get the necessary loadings for the most needy. Since then one backward step has followed another: the prime minister's promise (at the national conference of independent schools) that every independent school would be better off; buckling to the states' demand that Gonski's 'national schools resourcing body' be ditched; acquiescing to the Catholic systems and spreading the money for need over half of all schools rather than Gonski's recommended quarter; the announcement that the extra funds would be phased in over five years from 2014; and, most recently, what appears to be the surrender of the idea of 'sector-blind' funding and a reversion to different funding 'models' for each of the three sectors. For all these reasons what Gillard wants from the premiers on 19 April is not Gonski but the appearance of Gonski. She may not get even that. She cannot afford to bribe or be seen to be bribing them. Several of the states have already canvassed their own Gonski-lite schemes, so why give the feds undertakings about how and how much they will spend on schools? And why would the four Coalition-governed states throw Labor an electoral lifeline? It is a far cry from the revolutionary bravado of Prime Minister Rudd and Education Minister Gillard six years ago. It is also a warning to the next federal government. Canberra is the Gulliver of Australian schooling. It is the biggest single spender, loudest single voice, and the only government to deal with all the others and with each of the sectors, but it runs no schools, employs no teachers, enrols no students. It is tied down by eight governments, all in semi-permanent election mode, by 24 separate schooling 'jurisdictions', shoals of interest groups, chronic antagonism between the sectors, and educational methods, infrastructure and patterns of spending dominated by obsolete industrial awards and agreements. Even had the revolution come with clear focus, priorities and educational targets, it would still have lacked headquarters and a chain of command, a fact demonstrated by the long, slow evisceration of Gonski. In other words, Labor's heart ran away with its head. The first task of any 'revolution' was and remains not to fix the schools but to fix the structures and machinery of schooling. That task has zero appeal for the Abbott government-in-waiting. To the contrary, to the extent that it has revealed its hand it seems determined to hose down expectations of what a federal government can do about schooling and push responsibility back onto the states. Specifically, it seems set to continue with the present funding system (condemned by the Gonski review as opaque, inefficient, and inequitable), although it may insert a Gonski-like modification or two. It will probably scale back or abandon Labor's national programs, emphasise the right of states and systems to 'adapt' the national curriculum to their own values and circumstances, drop the 'top five' target (or slot each of the states into the international league table), and run with slogans such as 'not more teachers but better teachers' or 'more autonomy for principals and school communities'. It is likely to keep MySchool, perhaps finding ways to reduce the amount of information about schools' resources. That will relieve the pressure, but not forever. The current funding regime demands around six per cent more federal money every year, not easy to find in any foreseeable future. And then there are those troublesome international comparisons of student performance and the ongoing bad news they are likely to bring. It might not be a federal government's fault, but it will be seen as a federal government problem. The pressure for and movement toward a national schooling system comes and goes, but will not go away. And Labor? No doubt it would be delighted to be saddled with the tattered legacies of its revolution in the case of a miracle election victory come September. It is much more likely, however, that they will have plenty of time to re-think the whole business from the ground up. Dean Ashenden was Ministerial Consultant (1983-86) to federal education minister Susan Ryan, and has been a consultant to many state and national education agencies. This article was first published on 7 April 2013.